Back in 2006 the “boyz” at Harley Davidson used the European motorcycle show (Intermot in Germany) to roll out the XR1200 prototype bike. It was styled after an American-only racing motorcycle, the XR750 dirt tracker which was an AMA Grand National Champion. At any rate, rumors percolated over the past couple years on when or if the bike would be manufactured. Most of the press and writings have been from Europe. 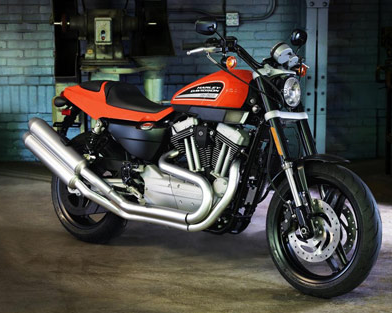 Harley confirmed that it will manufacture the motorcycle and it will go to dealers in Europe, the Middle East and Africa THIS month. This is the first time where any Harley model was delivered outside the U.S. prior to launching a motorcycle in the states. That in of itself is something to take pause over. Some people-people who can use words and speak in complete sentences-are unable to accept clear facts or simple truths, but the fact is there are no current plans to make this bike available for the U.S. market so put away your cash. Evidently those marketing types don’t think there is enough demand to introduce it. The XR750 was all about flat track racing and is where the XR1200 takes many of its styling cues. It’s a 1200cc Sportster based machine with a sport tuned suspension. It has inverted 43mm forks and the ergonomics are customized for the European rider. The bike has wide handlebars with semi-rear-set footrests to provide an upright and sport riding posture. It looks to have plenty of cornering clearance. For those from the Americas it’s difficult not to criticize a Europe only launch, but are customers in Europe demanding a flat track inspired Sportster? I suspect it has a lot more to do with cannibalizing the Buell inventory in the U.S. dealer network. Photo courtesy Harley, Great Britain. Just ride it, it is superb , totally different from a Buell. @ Ron — if inclined to pull together a couple paragraphs on your XR1200 riding experience I’ll write a post and provide you attribution for the efforts. Since we don’t have the bike in the U.S. yet it would be great to get some insight from someone actually riding one. A photo always adds to the post. this bike is in the us now. i just saw it a few months ago at the local harley dealership. I rode one and they are one of the worst bikes I’ve ever ridden.